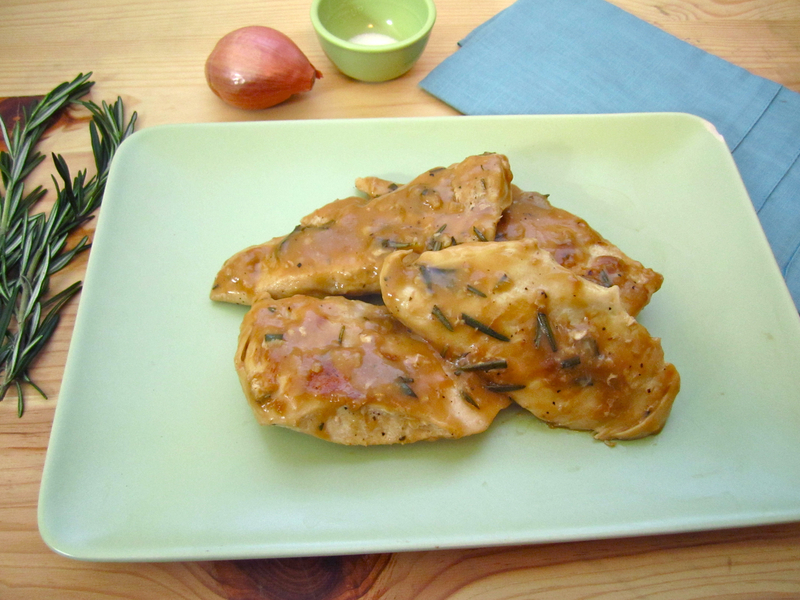 Tuscan-Style Rosemary Chicken - Eat. Drink. Love. As I was cleaning some things in my kitchen last week, I came to the realization that I have a bunch of cookbooks that I have only made maybe one or two recipes out of. Seems like kind of a waste, don’t you think?!! It’s time to pull those suckers out and try some new recipes! One of the things I don’t like about some cookbooks is that they don’t have pictures of the recipes. I really hate that. You know what they say, we eat with our eyes first! Unfortunately for me, a few of the books I have don’t really have any pictures, but that doesn’t mean the recipes aren’t any good! I saw this recipe in one of my Rachael Ray cookbooks and though there wasn’t a picture, it sounded like it would be pretty good so I decided to give it a try last night with a few changes. I’m glad I did because it was really tasty! 1. Heat a large skillet over medium-high heat. Sprinkle chicken with salt and pepper. Add extra virgin olive oil to pan and the garlic cloves. Heat for 30 seconds. Brown chicken 2-3 minutes on each side and remove from pan. 2. Add vinegar to the pan and allow for it to cook off. Add the butter, shallots, and rosemary to the pan and cook for 2 minutes. Add the flour and cook for another minute. Whisk in the wine and reduce for 1 minute. Whisk in the beef broth and allow the sauce to come to a boil. Return the chicken to the pan and simmer for 7-8 minutes to allow the chicken to cook thoroughly. What a way to make chicken, Looks so delicious. Thanks for sharing. Sadly I will probably never be in Tuscany, but that does not mean I cannot experience the cuisine! The picture does look tempting and I love the ingredients in the sauce. Well done-yum! This looks wonderful and the sauce sounds like it would be so yummy. It coats the chicken so well and I’m a huge fan of rosemary. maybe I should,,,by the way this chicken dish look Yummy,I use alot of shallot on my cooking. Delicious. I love rosemary, especially with chicken! I agree about the pictures in cookbooks thing. I’m much less likely to try something new if I can’t see it first. That chicken does look really great! And like most of Rachael’s recipes, seems pretty simple! That looks really tasty Stephanie! And easy to make kosher, just sub Earth Balance for the butter. Also I love the green color of the plate, it’s my favorite vintage mint-green color. I’m guilty of the same thing. I have a baker’s rack full of cookbooks that I’ve only made a few things out of. Maybe I should give those a good look over. Anyway…to the chicken. Girl, you’ve done it again. Looks and sounds delicious! A perfect simple weeknight dinner–this looks great! That would be delish over a giant bowl of cous cous! It sounds delicious! I have fresh rosemary in my garden so I think I will try this recipe soon. This looks so awesome!!! Love the coloring too … and the ingredients sound like a perfect match. This is a must try! I can honestly say that I have about 50 cookbooks and rarely open them for actual cooking. I just love the pictures and getting ideas. This looks pretty good. Think I might be trying it out soon. And I agree; the cookbooks without pictures are annoying. They may have great recipes but I know that when given a choice, I’ll go for one with photos first. Oh I hate cookbooks without pictures! Gross!! But that’s why we have each other right?? To provide the pictures where the cookbooks fail us. This chicken sounds and LOOKS fantastic!!! Thanks for sharing! I have a very hard time using my cookbooks that don’t have pictures. This chicken looks amazing! I love rosemary! I got my package from you today! I can’t wait to make Whoopie Pies! Thanks again! Love this chicken! Sounds great, I love rosemary! Check out my site today, I have an award for you! Rosemary and chicken pair so well together. This looks fantastic! Sounds and looks delicious. Sometimes there’s nothing better than a simple chicken dish with a bit of sauce. I think for us food bloggers or food blog readers we will need a photo to go with the recipe even more then ever. We’ve been spoiled with all the beautiful photography that goes along the recipes shared in our community. Thanks for sharing this recipe, it sounds and looks so mouthwatering. I think I’m one of rare foodie who doesn’t own too many cookbooks. Well I started to buy more non-Japanese cookbooks or given by someone as a gift, but I visit food blogs and I find so many delicious recipes that I felt there is no need to even buy cookbooks anymore. See, like this… you make the nice chicken dish from the book and I don’t have to buy the book… hehee. It looks delish! We do eat with our eyes, and I prefer cookbooks with photos because it helps me to know how the recipe should look. Still, it’s also fun to use your imagination when you’re reading recipes and visualize how you think the dish would look in the end, and yours looks wonderful! I gotta admit, I love to sit and flip through cookbooks looking at the pictures. There is only one cookbook with out pictures that I enjoy and that is Julia’s. This chicken looks fabulous! looks great! I love Rosemary Chicken!